CeFaan Kim was there for the happy homecoming. CYPRESS HILLS, Brooklyn (WABC) -- The police officer who was shot in Brooklyn while responding to a call of an emotionally disturbed man left the hospital Friday amid a sea of blue and a chorus of applause. Officer Hart Nguyen walked out of Jamaica Hospital with his arm in a sling and a smile on his face, while fellow officers stood at attention and lined the path to a van that whisked him and his loved ones from the scene. NYPD Officer Hart Nguyen leaves hospital a day after being shot in the line of duty. Officer Nguyen is a father of two, who even from his hospital bed, was trying to cheer his NYPD partner up. His partner was by his side along with Nguyen's wife and parents as he arrived back home in Bath Beach Friday night. Nguyen walked out of that home in Cypress Hills the same way he walked out of the hospital, on his own two feet without a hint of panic on his face. Bloody and wounded, he walked himself to the EMTs. Police continue to investigate the incident that led to Nguyen's shooting, which began when a woman called 911 Thursday afternoon telling the dispatcher her son was acting erratically but was not violent or armed. Nguyen and his partner responded to the Cypress Hills apartment following the call about the 29-year-old man, who lived there with his parents. When the officers entered, authorities say the man opened fire, striking Nguyen in the right arm as he entered a bedroom. Two other bullets hit his bulletproof vest. He did not return fire. The 30-year-old Nguyen works out of the 75th Precinct and has two years on the force. The suspect, Andy Sookdeo, barricaded himself in the room, forcing a standoff with police, officials said. Officers moved in hours later and found the man dead of a self-inflicted gunshot wound. 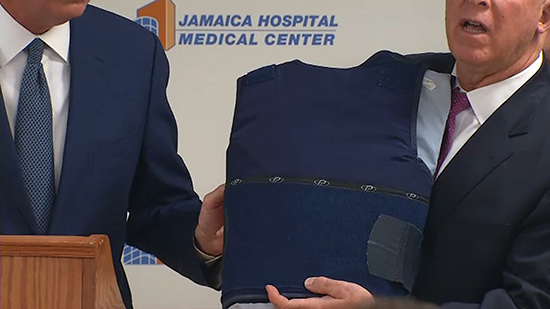 The mayor and police commissioner showed off the vest during a news conference and credited it with saving the officer's life. "This young man was definitely saved by his vest," de Blasio said. "It made all of the difference here." De Blasio described him as being in good spirits. "He's showing a lot of spirit, a lot of energy," the mayor said. "Our officer is going to come through it, he's a brave young man, he's going to come through it." Police recovered two guns near the suspect's body. "Our officers go into any situation and never know how it might turn on a moment's notice," de Blasio said. Police have had several previous calls to the house for disputes with an emotionally disturbed person, authorities said. His partner says he hasn't slept since being shot because they had to keep him awake as he recovered. His wife says she was terrified when she got the call, but now he's home, still smiling.